Chris Sale delivered one of his strongest outing of the year but the Red Sox offense was held to just three hits as the White Sox prevailed 1-0 in the opener of a weekend series Friday night at Fenway Park. 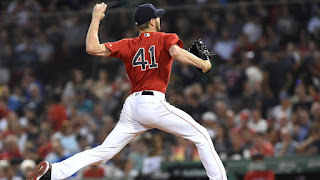 Sale (pictured) struck out ten and scattered six hits over eight innings as his record dropped to 5-4. It was his third straight start with a loss. Chicago starting pitcher Dylan Covey shut the Red Sox out over six innings. He allowed all three Boston hits and walked one while striking out seven. Sale's velocity was especially impressive. He threw two pitches at 100 mph and eleven more at 99. He said after the game that managing his days off has helped to this point of the season.